UQCI8423 Nothing better than watching masters at play! 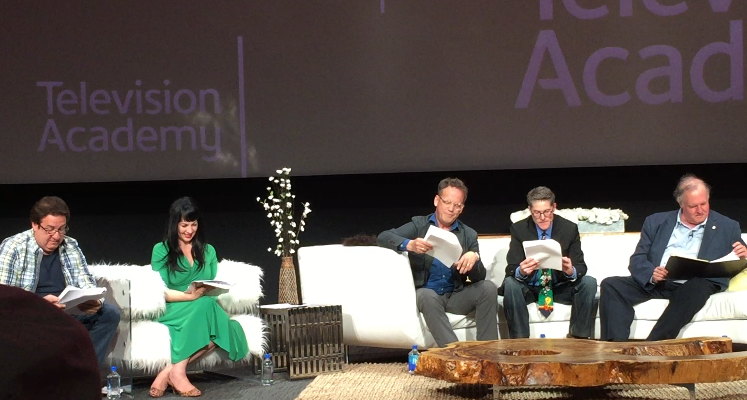 Last night we were thoroughly entertained with the talents of Bob Bergen (Porky), Dee Bradley Baker (Daffy), Jeff Bergman (Bugs and others) & Grey Griffn (all female characters). It was a lovely evening with Matt Craig and Gary Hartle creator/writer team of “Wabbit” – a Looney Toons Production. 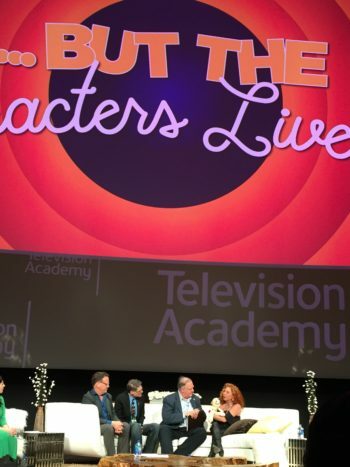 The cast performed an episode live, and then they screened it. OMG! It was funny and fun enough just watching the actors live the characters and then watching our iconic favorites animated on the big (and I mean Huge) screen, was hysterical! Mallory Lewis, daughter of Shari Lewis carries on her mother’s famous sock puppet Lamb Chop and added more fun and stories to the night. The insightful notes and stories from casting director Andrea Romano were informative and funny. And Mark Evanier did a great job moderating the night. I love this business! This event completely exemplifies the fact that animation is hard work, skill and talent. And yet, if you can’t have fun, don’t bother coming in the booth! No Comments on "But The Characters Live On"